To see mushrooms you need to get up early in the morning. Its 7 a.m. Up we go direction Kiningi, the entrance to the Volcanoes National Park. 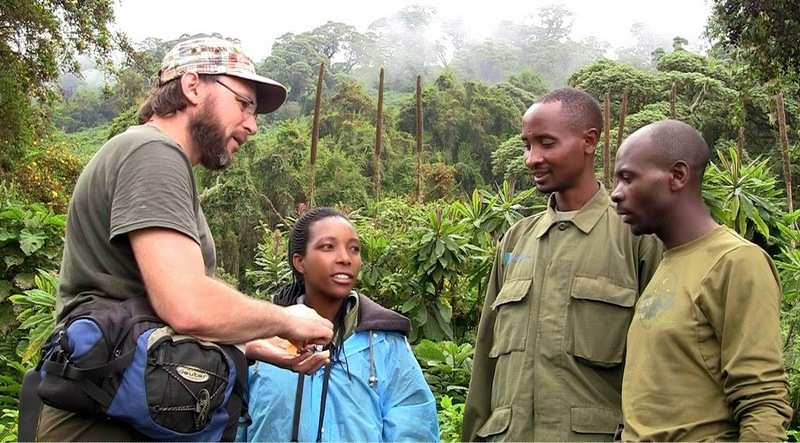 We have an appointment with Raymond, a ranger who will accompany us during our mycological expedition on the slopes of the volcanoes. We are not alone – a visitors centre with a fleet of 4x4s and tourists all hoping to catch a glimpse of the mountain gorillas. Our first stop: the Bisoke or Vasuki volcano (3711 m) shrouded in the mist. A few soldiers were waiting for us. To protect us during our ascent from the buffaloes they told us. Our journey was painfully slow between the giant Lobelias because the underground was wet and spongy. 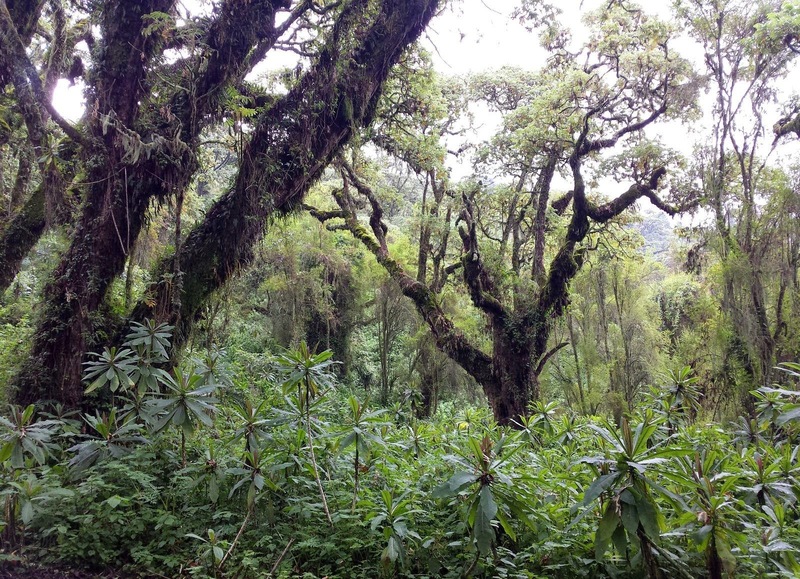 The magnificent trees are completely covered with mosses and lichens… including a nice variety of edible mushrooms. We also found a species of oyster mushroom that we had not so far found on our mission Pleurotus cystidiosus; certainly one to try at Kigali farms. Raymond was very interested in our mission and in wild mushrooms. He knew some of the species which are edible or not, but regretted that he knew no more than that. No problem said Jérôme, because we will make an illustrated guide of edible mushrooms. This will also be useful for people such as the rangers of the park. The harvest is good. In the basket of the mycologist are 20 plus different species including a light green coloured Agaricus mushroom. Maybe a new species for science but still be confirmed on our return says our mycologist with hope but also with caution. 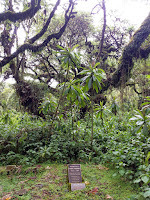 After a few hours plodding through the mud we reach the remains of the camp Dian Fossey who was murdered here in 1985. 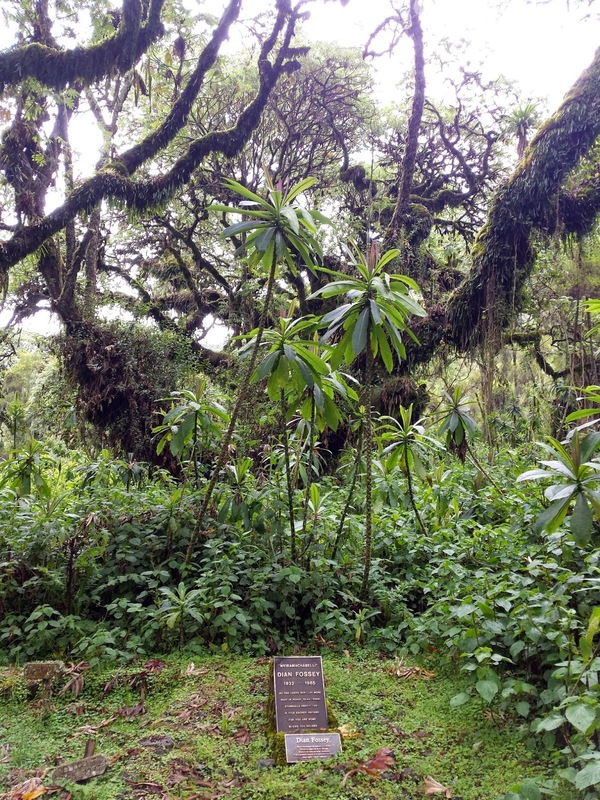 Here rests ‘Nyiranachabelli’ the ‘lonely spirit of the wood’ it reads on a memorial gravestone, next to the remains of ‘Digit’ one of her favourite gorillas. The day went well and it was time to start our descent to the base camp where our scientists had some evening work to do. On our way back we see a fresh footprint of a gorilla … one can dream…if only we could see one.